Last month, actor Jim Carrey delivered the commencement address to the graduating class at the Maharishi University of Management, and I have to say I was really impressed with the inspirational content he delivered to the audience; he said some pretty deep stuff, stuff that I hope all those graduates take to heart as they move out into the world, the most important of which was that everything we do in life comes down to a choice between love or fear. Carrey’s full commencement address can be found on YouTube (see link below). The first part is mostly just jokes, but he gets into the good stuff just after the 10 minute mark, so if you haven’t got half an hour to watch, then forward through to that point. Is the safe route really a sure thing? This really stuck with me, because what is the point of choosing the safe route if the safe route can still fail, especially if there’s no happiness to be found along that route for you? If you’re always going to feel like you’re meant for something other than what you’re doing, and in the end, you still have a very real possibility of that security blanket being torn away anyway then why not follow that other path, the one you most want to follow, instead? Yes, you may fail. But you may fail in the safe choice, too. 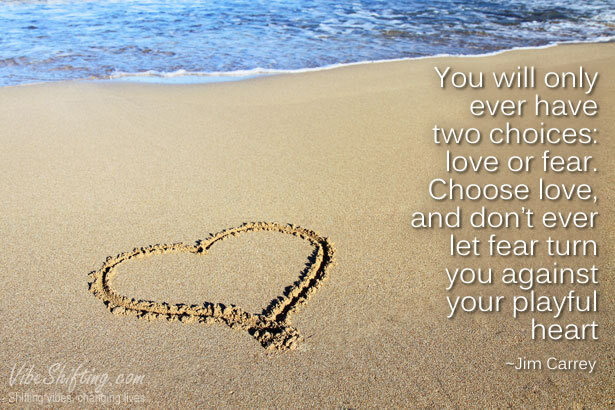 So do you choose love or fear? So many of us look towards our idols; the ones who’ve already done what we want to do, with a mixture of excitement, envy, and sadness. Because we wish so desperately that we could just be where they are; we want so much to just be able to figure out that magic key that will get us to where we want to be. 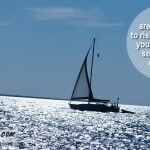 But the problem is that at our core, we don’t really believe that it is possible for us to ever get there. We don’t really believe that we could ever be what we most want to be. Because we’re not sure we really deserve it. Because we’re not sure that we’re good enough to make it. That last part is really important. The voices you hear inside your head, telling you that you’ll never make it, that you’re not good enough, that you still have to do more; the voices that compare you to everyone else… you must stop listening to them. Because nothing you do will ever satisfy them. You could have achieved every goal you’ve ever had, earned every accolade available and won every prize that’s out there, and those voices would still tell you that you’re not good enough. But it’s not true; what those voices say is all just smoke and mirrors. And that last sentence is the key to letting them go; once you begin to realize that you are an integral part of something much greater than what you see as you, once you realize that you exist beyond space and time, that you have always existed and that you will always continue to exist, beyond death and beyond birth; once you begin to remember that you are a part of infinite source energy, then you can see how ridiculous those voices really are. You are infinite love; limitless and without end. The voices are just fear. But what if I messed up my big chance? Regret. It’s a heavy burden that so many carry, believing that their one and only chance for ever achieving the things they most want to achieve, or of becoming all that they most want to be is gone. A choice made of fear, forcing them to forever follow a path that they never really wanted, and which they resent more and more with each passing day. But the thing is, there is no “last chance”. That’s not how the Universe works, unless you ask it to work that way. Shift your energy, shift your mindset, shift your focus and shift your beliefs. And as you shift, the Universe shifts with you and for you. You are in control. And you get as many chances in life as you want. You just need to get yourself clear on what it is that you want. Your job is not to figure out how it’s going to happen for you, but to open the door in your head and when the doors open in real life, just walk through. Don’t worry if you miss your cue. There’s always doors opening. They keep opening. So open the door in your mind. Open yourself to possibility. Allow yourself to dream and allow yourself to believe in that dream. This is how the doors show up; trust that they will be there as you work towards the dream, and don’t ever be afraid to step through them when they do. Love or fear? Love will carry you through, but fear will hold you back. So which one will you choose? This is wonderful Nathalie! just what I needed to read today, after spending an afternoon of being helpful to my sister, when she said that I am old (I’m not) and my life is basically over and I will never get to where I am going, but she loves me and saying this for my own good. Oh God, well I may have attracted that myself somehow or other bu obsessing about my crazy family. I should just let go of them completely and not even think about them. Free myself of them. I know it sounds sad and cruel to some, but they are pretty crazy and may be detrimental to me. The truth is, I really do not care what she says. It is only her opinion from what she sees, but this changes. OK, so I made mistakes and did not get on the boat when opportunity came by, but I did have a good time and I knew then that there would be opportunities ahead. I cannot regret that. Most people do not even get to have the time I had, so there What is so bad about that? Why must we look at society’s flawed premises and base our reality on those when the universe does not even operate that way? I have not seen Jim Carey’s video, but I will when I get a chance. He is an LOAer after all. In my experience, I’ve found that when someone tells you they are saying or doing something “for your own good” it’s usually to justify in their own minds something deliberately hurtful. Let it go. And use a vibe-shifting technique to change your mood as soon as possible after unsettling encounters with your family (set up a happy tunes playlist on your MP3 player, stick a quote that never fails to uplift you in your purse so you can pull it out whenever you need it, visualize the life of your dreams, etc.). Thank you so much for these pointers! I appreciate the input. No, I do not feel old at all and people think I am several years younger than I am and even my body is, i.e., my hormone levels are than or a younger woman. So, my sister speaks from her perspective but it does hurt because the negativity hurts. I am still not at the level at which nothing penetrates me, but reading your blog sure helps. Also, since starting LOA 4 years ago, I feel as if time is not progressing. I feel as if it is moving slower, not as fast as everyone else says it is. I feel is is allowing down for me. Not sure how else to describe this phenomenon, but disciples feel this when because that is one of the effects of meditation, as is worrying less or not at all about stuff that others freak out about. Cool, huh? my hormone levels are that of a younger woman. I feel it is slowing down for me. It is hard to be around negativity all the time. It’s draining. Avoid it when possible, and when it’s not, try to keep yourself focused on something else, and remind yourself that the other person’s path is theirs to follow. You have chosen a different path, and have chosen to focus on what is positive in life. It’s OK if other people think differently than you do; they have their own journeys to take. Again, once you are out of the negative situation, then use a vibe-shifting technique to get yourself back into happy-mode as soon as possible. Time is a fascinating thing. And it really does feel like we have some degree of control over it — when we feel rushed and hurried and stressed that we’re going to be late, it does seem to go by faster. But if we can shift our thoughts and convince ourselves that we have plenty of time, and stop rushing, we actually do seem to end up with more of it. I’ve experimented with this, and it really works. Having children also seems to have a weird effect on time. As the saying goes, when you have children “the days are long but the years are short”.